When Srivalli announced the Dosa Mela I am really overwhelmed as dosas are south Indians all time favorite dish. It can be soft and spongy or crisp and thin. Either way its satisfying. The Uthappam varieties are eligible to challenge the pizzas with various topics. Yet you do not need a coke or pepsi to swallow the pizza bites. A dip in u’re favorite chutney or sambhar would take you to heavens. Unlike these days Idli batter was made twice in a week when there were no refrigerators. The first day it would be fine to make idlis but the second day it would be fit for dosas and third day with onions and thaalipu it would turn into delicious uthappams. Yet they were delicious in all forms. Usually in my grandma’s days for dosa she would prepare it differently. For the rice she will add equal portions of raw and par-boiled rice which would enable us to make thin crisp ones. I know all my friends would share nice goodies but I thought this dosa is really rare and I have hardly heard about it in the blogging world. So this dosa mela would be a nice place to have a record of this. This Mudakathaan keerai (Cardiospermum Halicacabum) is very good for reducing Vadham in the body and this dosa is the best way to consume the bitter leaves. Amma makes a wonderful “Kaara chutney” to send this spongy goodies inside. Again the sliced shallots and the chana dal here and there were great bites when you eat this. Mix the ground keerai paste to the idli batter. The batter would trun to a wonderful green. In a kadai heat 2 teaspoons of oil and add the mustard seeds. Once it starts spluttering add the chana dal and fry till it turns golden. Add the chopped shallots and curry leaves and fry till the onions turn pink. Add this to the idli batter and mix well. Heat a tawa and when u drizzle few drops of water it should sizzle and disappear in 4-5 seconds. This is the temperature when u can start making dosas. Coat the tawa with few drops of oil evenly (u can use a small cloth folded as a knot and dip it in oil and rub it on the tawa. Be careful not to burn u’re fingers). Pour a laddle full of batter and spread it around evenly to 1/4 cm thickness. Drizzle some oil around and cook for 2-3 minutes in simmering flame. Now flip to the other side and cook for another 1/2 a minute. If all is done in simmering flame this wuld be enough to turn it spongy. Now take it off and serve it with the kaara chutney (recipe follows). Nirmala..this is a lovely one..as you said its is one of its kind…thanks for sharing such a unique one with us.. Thanks for introducing the keerai. It is indeed unique. Nirmala..just now i have grinded for mudakathaan dosa. i will try the kara chutney recipe. keerai dosai .. thats new to me! will try it soon. Hi Nirmala.This is the first time I am commenting on your blog.But i have visited urs before.When Srivalli announced Dosa Mela ,this dosa strucks me. Since I dont get this keerai here i couldnt.Glad you came with this.Perfect dosas!!!! This is one of my fav variety of dosa. My mom used to make the same kind. I wish I get some here. Nice Entry. Nice recipe. I have been searching for traditional recipes with different herbs that have become rare now. Please post any that you may know. 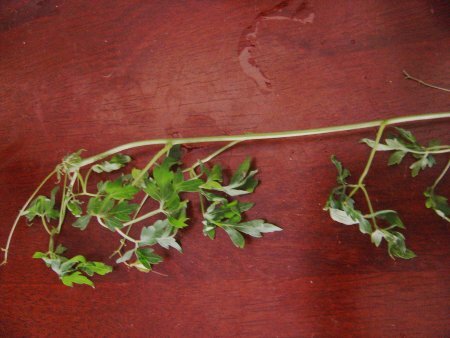 Is Mudakathaan the Tamil name for Cardiospermum Halicacabum, a creeper ? Agree with Kalai it is a treasure… This definitely needs to be recorded – Thanks for blogging this keerai. It looks good! The only leaves with which my mom made dosas were drumstick leaves! This is new – like you said – its one of a kind! Thanks!! Any idea what you call it in English? Hi, this keerai is not available in the Chennai markets every day too. May be times have changed in 10 yrs that I have been in the US. My mother’s servant maid who was too old to work anymore would bring this keerai when she visits us. This keerai grows like weeds on fences and other places. 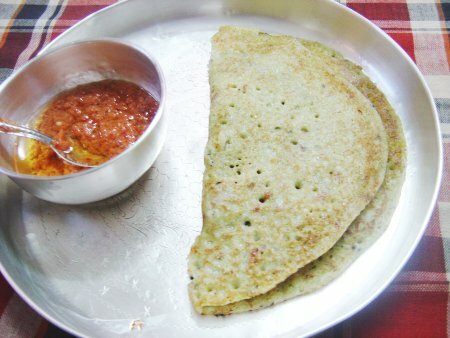 Kara chutney and Modakathan dosai was my favourite Sunday breakfast. Srivalli,thank you for bringing back old memories with this recipe. The only difference I can notice is the colour of the dosai. My mother’s was very green and in fact, my nephew called it the “green dosai”. One more message..I have a doubt.. What are the health effects of this green? And, what is vadham? Thank you. Hi… I hope you are able to help me… We are in Trivandrum now and trying to see if this keerai is available here. By chance do you know if this keerai has a cooresponding Malayalam name? Does it bear any fruits? If possible please respond directly to my e-mail ID also in addition to this blog as we are here in Kerala only a few more days. jenkumar at gmail dot com.